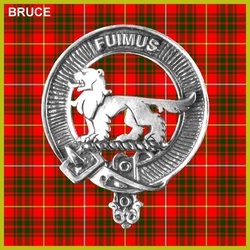 It is no accident that the name of Bruce means to most Scottish people a person rather than a family, and that King Robert I is as often known in common speech by his surname as by his royal title. The first Robert Bruce of Annandale was an English landowner of Norman origin, who was granted this important border zone by David I in 1124. When Alexander III died, and succession to the Scottish crown was left in doubt with the death of his grand-daughter the “Maid of Norway”, the Bruces had already been for five generations a Scottish landed family. The Lord of Annandale (grandfather of the future king) was then an old man; almost half a century earlier, owing to his mother being the second daughter of David, Earl of Huntingdon, and therefore niece of William the Lion, he had been acknowledged as heir-presumptive when Alexander II expected to die childless. When the question of succession was submitted to Edward I of England as arbiter in 1291, Robert Bruce was one of the two chief competitors; but as there were now descendants of the Earl’s elder daughter the crown was awarded to her grandson John Balliol. Although failing in this vital contest, Robert the “competitor” was a magnate of importance in various parts of Scotland; from his mother he also inherited a northern barony including the Garioch in Aberdeenshire, and his son married the heiress of Carrick in Ayrshire. So young Robert, born of this marriage on 11th July 1274, is justly described as “a Scotsman, born amongst Scots” by his latest biographer, Professor G. W. S. Barrow. How through “toil and weariness, hunger and peril” (in the words of the Arbroath declaration of 1320) he won the independence of his country as well as his own right to the throne is a story and an achievement which has made the name of Bruce dear to the Scottish people. He had many loyal supporters in the struggle whose names are famous in Scottish history, and no doubt many obscure kinsmen and others from the Bruce lands in Annandale and Nithsdale, and Highlanders from Galloway and Badenoch, fought in the armies which he led. The old lordship of Annandale was made over during the king’s lifetime to his friend Thomas Randolph, Earl of Moray, and it eventually passed to the Douglases. In the next two reigns the name of Bruce became associated with a more central part of Scotland, lying on either side of the River Forth where it widens out above the modern bridges to form the Firth of Forth. Soon after Bruce’s son David II returned from a long captivity in England he granted the castle and barony of Clackmannan to his “cousin” Robert Bruce, whose exact relationship to the king is not known. That was in 1359, and the family continued in possession until 1791, when the last Mrs. Bruce of Clackmannan died, leaving the great two-handed sword of the hero king (with which incidentally she had “knighted” the poet Burns) to another Bruce of the Clackmarman line, the Earl of Elgin. The head of yet another cadet house, Bruce of Kennet, inherited the title of Lord Balfour of Burleigh through the female line. Meantime on the south side of the Forth a family “claiming the nearest descent of any of that name to the blood-royal” had taken root and spread out branches. Sir John Bruce of Airth, who probably built part of the castle on its rock above the river, was murdered in 1483 by a neighbour and brother-in-law Menteith of Karse; and when the Lords of Council tried to make peace between the two families we find on record a family group consisting of the new laird Robert, his uncles Alexander and Lucas, another Robert Bruce, “and others their kin and friends”. Among the many offshoots of this branch were two famous Bruces of Kinnaird, the one a churchman and reformer, and the other the Abyssinian traveler and writer. Holders of the name of Bruce may not be as “clannish” as some others in every sense of the word, but they have a special right to pride of race. Even in the prosaic 20th century a Lord Elgin, who gave the authority of his great name as well as personal support to movements for preserving the site of the battle of Bannockburn, and setting up economic and cultural bodies such as the Scottish Development Council and the National Trust for Scotland, found occasions for showing the king’s great sword in public, and invoking the inspiration of his memory.